Short distances and scenic routes make New Zealand the perfect destination for self-drive travel and there is no better place to start than in our beautiful Bay of Islands. Only 3 hours from Auckland, golden sand and azure waters await. If you’re driving from Auckland and you missed our guide to driving from Auckland to the Bay of Islands, check it out before continuing on to Paihia below. If you’re following on from the Auckland guide, let’s pick up from where we left off. You’ve spent some time wandering around the funky town of Kawakawa, seen the Hundertwasser toilets and maybe even spied the old steam train rolling through town. So now what? As you leave Kawakawa, Highway 1 splits to become Highway 11. Though you are only 20 minutes drive from Paihia, resist the urge to rush. Opua is the most popular port for those who choose to reach the Bay of Islands by sea. In fact, it is commonly the first port for those who have sailed across the Pacific. It remains a busy destination for cruisers due to the deep, sheltered waters and the plethora of facilities for visiting sailors. Check out the opulent yachts anchored here. While a pretty place to stop, Opua also serves as the easiest means of car access to Russell. Cross from Opua to Okiato with your car to drive through the beautiful back scenic route to historic Russell. If you’re feeling energetic, walk the Opua to Paihia coastal walk which boasts stunning views of the Russell peninsula and beyond. Located in the far north of New Zealand, Paihia is a veritable hub for outdoor adventure. Soak up the sunshine and while you’re at it, why not try kayaking, swimming with dolphins and scuba diving. If a more casual pace is what you’re after, enjoy walks along Paihia Harbour, venture out to the Haruru Falls, located in a hidden valley only 10min drive over the hill from Paihia. The walk itself is very short, only 3-5min walk from the carpark. Be careful on rainy days, the walkway can be quite slippery. If you’re keen to get out on the water, take a passenger ferry across to Russell for a romantic afternoon and see Paihia from across the harbour. If you’re looking for attractions close to Paihia, drive on to the next town to learn about early New Zealand history at the Waitangi Treaty Grounds where New Zealand’s most historical legal document was first signed. Since you’ve made it as far as Paihia, why not continue on to Kerikeri or even to Cape Reinga at the northernmost tip of New Zealand where the Tasman Sea and Pacific Ocean collide in a swirl of currents. 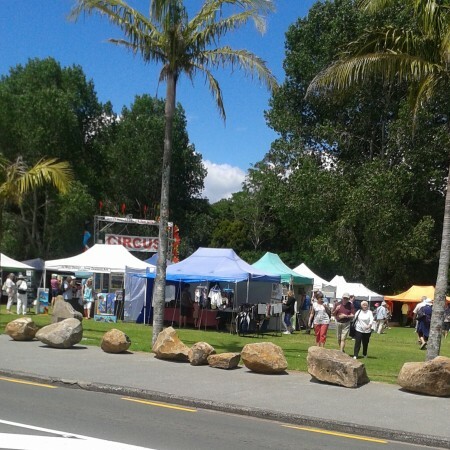 Whether Paihia is your final destination or you plan to continue northwards, there is bound to be plenty to keep you entertained and relaxed on Paihia’s golden shores. You can click on the little star next to where it says Paihia at the top of the map. This will save it to your Google Map (You will need a Google Account for this). Scroll across and click on the Maps tab and you should see Paihia there. Now when you are in the Menu you should see Paihia just above the Traffic option now.